2018 Suzuki GSX1250FA. Picture credits - Suzuki. Submit more pictures. With a full 1255cm3 of torque-producing displacement, the powerplant is tailored to wide-ranging sporty enjoyment, generating peak torque from relatively low in the rev range. Chrome-nitride coating, applied to each piston�s upper compression and oil control rings using a physical vapor deposition (PVD) vacuum chamber system, is harder and smoother than conventional chrome plating, resulting in reduced friction and tighter cylinder sealing. Engine details: A secondary balancer shaft enhances the engine�s smooth operation. Fuel system: Injection. Suzuki Dual Throttle valve (SDTV) fuel injection, featuring 36mm throttle bodies. Ask questions Join the 18 Suzuki GSX1250FA discussion group or the general Suzuki discussion group. Bikez.biz has an efficient motorcycle classifieds. Ads are free. Click here to sell a used 2018 Suzuki GSX1250FA or advertise any other MC for sale. 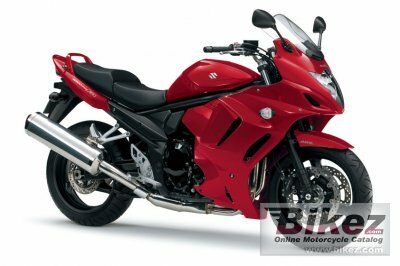 You can list all 2018 Suzuki GSX1250FA available and also sign up for e-mail notification when such bikes are advertised in the future. Bikez has a high number of users looking for used bikes. Before you buy this bike, you should view the list of related motorbikes Compare technical specs. Look at photos. And check out the rating of the bike's engine performance, repair costs, etc.